This mod drastically reduces the difficulty of the easy difficulty mode for a truly narrative-focused experience. Brought to you by the mod making tools pyGFF and GDApp! 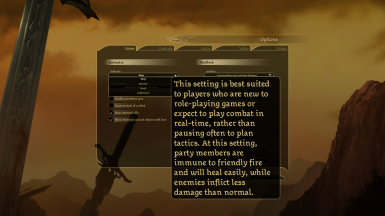 A mod for those of us who play Dragon Age Origins for the narrative, and the default easy difficulty isn't easy enough. This mod alters the easy difficulty settings to be much easier. This mod does not alter normal, hard, or nightmare difficulties. However, this mod is not compatible with other mods which edit difficulty settings - regardless of which mode(s) is affected - due to the nature of the difficulty settings file. Note: Mage basic attacks do not deal increased damage. The game is still insanely easy regardless. DLuf made a post about why this is, if anyone wants to make the game even easier. I haven't encountered any issues with using this mod, but let me know if you do. To install, place difficulty.gda in your override directory (e.g. \Documents\BioWare\Dragon Age\packages\core\override). To uninstall, remove difficulty.gda from that directory.